Currently Philly.com is running the end of season fan voting for the Philadelphia Eagles. If you don’t know how it works, you log on and go through essentially the entire roster and choose if you feel the player should “stay or go”. Once you’ve voted on the player the current vote result is shown. There were 24 offensive players, 30 defensive players, 3 special teams players, 3 coaches, 3 administrators and a mascot listed. There have been between 2000-5000 votes cast so far, (you don’t have to vote for every player). I found the results very surprising. Here’s the breakdown. On offense the fans want to keep ALL of the starters. This is the offensive machine that finished 4th overall in the league but generated a league high 39 turnovers. Here’s who the fans voted needed to “go”: Vince Young, Ronnie Brown, Steve Smith, Winston Justice, Julian Vendervelde, Jamaal Jackson and King Dunlap. That’s it!!! The fans even voted to keep Chad Hall, Mike Kafka and Owen Schmidt. I can’t say I disagree much with this list but keeping an experienced offensive lineman, Justice or Dunlap, is probably not a bad idea. Personally I’m torn over DeSean Jackson. I feel he let this team and fan base down by not playing hard and missing the Arizona game for disciplinary reasons. He’s a tremendous talent but needs to come to work every day. If a good trade for a 1st rounder was offered I’m not sure I wouldn’t move him. The fan base feels different with 74% of the fans wanting him back. On defensive the fans want to keep 10 players that started most of the season. The only full time starter voted to “go” was Asante Samuel. Only 37% of the fans want him to return. We voted that Casey Matthews, who took an early season beating from the fans and media should stay along with former 1st round pick Brandon Graham. Here are the remaining defensive palyers the fans want to “go”. Some of these guys did contribute during the season to the 10th ranked defense in the league, Juqua Parker, Trevor Laws, Victor Abiamiri, Cedric Thornton, Akeem Jordan, Moise Fokou, Curtis Marsh, Brandon Hughes and Tom Nelson. Personally I like Parker, although he’s getting up in age. I also like Fokou and think I would keep him. The three special teams players listed, Alex Henery, Chas Henry and John Dorenbos were all voted to “stay”. Henery only missed 3 FG’s all season but 2 were in the 49er’s game that would’ve put the game away for us. Overall he had a great season. Both Henery and Henry are rookies. So what we’re saying is that we are very happy with the team that has been put together. We want 24 of our 25 starters to return from a team that went 8-8 and missed the playoffs. What could we possibly be thinking? We’re thinking about the coaches and administration. 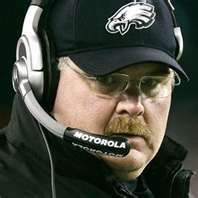 56.6% of voters call for Andy Reid to “go”. 53.9% of the voters call for Marty Mornhinweg to “go” and 75.1% of the fans voters call for Juan Castillo to “go”. Personally I think they should all stay. I’m disappointed in the 8-8 season but I still have confidence in Reid and like him as our coach. I think far too much blame has been placed on Castillo. Without making excuses for him he did have new postion coaches at DL, LB, corners and safeties. That’s an entire new staff to go with a new coordinator and a handful of new players. The lockout did hurt them. I feel they will be much better in 2012. On the offensive side of the ball I think Mornhinweg did a decent job that went bad due to the turnovers. For the first time in years the Eagles moved more to running the ball and utilizing the talents of Shady McCoy. I’d like to see them run the ball even more. Michael Vick was sloppy with the football early in the year before McCoy was established and the O-Line came together and it cost the Eagles games. That’s on Vick and some costly fumbles. As mentioned earlier Jackson’s lackluster effort at times hurt the offense. The offensive line improved greatly as the season went on. As far as the administration, 83.3% of the fans voted that Howie Roseman should “go” as the GM and 70.6% feel that Joe Banner should “go”. We have decided to clean out the major coaches and the administration that put together the team that has 24 of 25 guys that we want to keep! Jeffrey Lurie got a pass. 57.4% of the fans want Lurie to “stay”. Even Swoop makes the cut with 56.9% of the fans voting for him to “stay”. Please note that the voting is on-going, however, in most cases the splits in the votes are so significant that they won”t change much. Final decisions on the coaching staff will probably come in the next week. Johnnie Lynn was fired last night and more changes could come but I don’t expect they will be major. Personally I think Castillo is safe but I could be wrong. As far as the players, I think we need to be looking forward to the draft to upgrade the players that we already like. The NFC East was down this year and the Eagles missed a golden opportunity to win the division and move on in the playoffs. They are a better football team than the Giants and the Cowboys but you have to win your games and not just talk about it. 2012 will be a better year. E-A-G-L-E-S, EAGLES!! !